The Voice by Jennifer Anne Davis is a YA novel about a heavy subject: sexual abuse. Yet Jennifer Anne Davis has made a well-written, easy-reading story about it. Not that the subject is to be taken lightly: she has made the subject readable. The story is about seventeen year old Audrey who has been kidnapped and raped by her uncle. During those weeks, she’s been on the international news and everybody knows who she is. But there is one thing that is keeping her alive: a voice. A voice that is literally music to her ears, telling her to hold on. And even so, that voice is the reason she gets free: it told her to scream when people where nearby the cabin where she was being held captive. Then the voice came, comforting me. He helped me hold myself together, and he gave me hope. He offered companionship that developed into friendship. He made me feel safe. Recovering from what has happened to her is hard, so hard she wants to kill herself to just have it over with. Her parents are trying to give her the space she needs, but Audrey feels they’re suffocating her by worrying about her. So she agrees to go live with her aunt in California for a while. Her aunt doesn’t let her just be, she helps her recover, even if it’s not easy for Audrey. And then there’s the boys next door, the strange twins. One is the school’s quarterback, and the other one doesn’t seem to like her much. But they help her, and then Audrey finds out things about them, that they had something to do with her escaping the cabin. 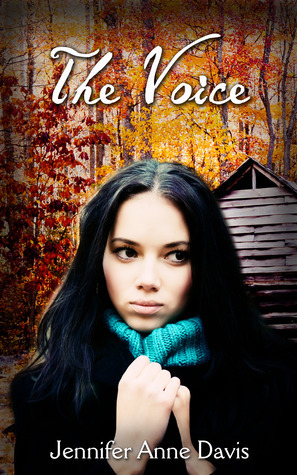 The Voice is a beautifully written YA novel that keeps you glued to the words written on the pages. You won’t stop reading until you’ve read the whole story. And then, you’ll want to start reading it again, and again. At least, that’s what I did. I hope you will read this book too, and enjoy it as much as I did. Because this book definitely deserves to be on the must-read list of every bookloving person. And please, if you’ve read this book, let me know what you think. Thanks again to Jennifer Anne Davis for sending me an e-book copy of your awesome novel. I hope to read many more books from your hand.